Elsie is inspired by the gold rush era Steam Ales of California. It’s our adaptation made fresh locally on our very own West Coast. 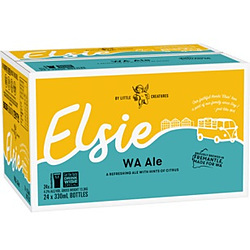 Elsie is a refreshing ale with hints of citrus that give way to a subtle maltiness, finishing clean and dry. It’s the perfect beer for the west coast lifestyle.